Don't share your weenie without asking? :) Heya Meghan and future listeners? Keep your pig in its blanket? Is this the holiday party? Yes.... why yes it is. You brought the booze and treats right? 7 Up: You like it, it likes you. "The big seven (and you pee after it.)" Weenies on pikes, intended to scare away any other invading weenies? Alas, I'm out of the loop. 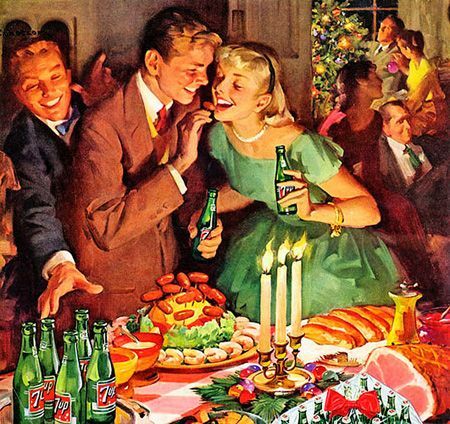 What is a holiday party and how would one get invited? At least the host / hostess was thoughtful enough to uncap all the pop bottles before setting them out on the table. @Ken FHP, one must be employed, then invited to company "holiday" party, then drink and act inappropriately, then move on to a successful career, then resign in disgrace as party details emerge several decades later from disgruntled employee(s). Upon further examination, not all of them. just the ones on the serving platter. Hello from a real computer, Meghan! I'm taking my daily pro-neurotics. You wouldn't want all the soda uncapped... that way it gets flat! But if it's uncapped, you can drop in your roofies. @coel, by "ganja" you mean "appetite aggressant"? Tamikrest, new to me and digworthy! When you've got reindeer on your roofie, you've got trouble. they did the job. the sour cream's a bit of a mess though. Which reminds me. I recently purchased a 3-liter Gummi Wärmflasche. What a treat. My cat especially loves it. Sidenote: Dutronc's "L'opportuniste" is one of the best takedowns of cynical politics I've ever heard. does your cat have cramps, or lower back ache? My cat is a thermal sponge. - so if your computer's running hot you can apply your cat and the cooling fan will slow right down...i need one of those. got it. no toothpick attacking. ...especially if it's someone in the trump administration. use something much bigger and sharper than a toothpick. This sounds like a wu tang beat? Oh! Tuxedo Park! in the actual park? @Warwick Joe: I think they sampled Isaac Hayes there. Also, both Warwick and Tuxedo Park are gorgeous. Orange County stand up! when hooverphonic started for a second i thought it was Isaac Hayes' version of walk on by. d'oh! PRB - i guess that's why then! Warwick is aight. And tuxedo park is like one big Eyes Wide Shut village. My husband taught at that school for 18 years.... first year not there! Ah, back from my lunch dash. I feel much better. Now, what's this about toothpicks? Fujiya & Miyagi ... very excellent! toothpicks are okay, but flossing is better. i think that's what Meghan was saying. In the public sector, the company buys no treats. As a restaurant host, don't ask "Trough for four?" My holiday party revolves around me buying a bottle of whiskey for myself and blacking out. Those are the perks of a one man operation. Wait, I can't dress up all slutty for my company's holiday party? All right, if you say so. No Ike, assless chaps are saved for NYE party.... sorry! yes, if my company has a holiday party i'd better bring a date, or else it will be only me there. @coel: Just stay out of the aquarium and you'll be fine. Wow 18 years at TPS, he must have some legendary parenting stories. Ah, yes. Dandy thing, this. hahaha.... he totally does! But let's be honest, don't all teachers no matter the school? thanks βrian but don't worry about me; i've got my rufie detector. I wonder how long before we get an injunction. The vote was 3-2, along party lines. I expect the next announcement will be Verizon offering big discounts to the 1%. I️ went to tuxedo high school. There were no problems or drama. Every student got straight As and were in bed by 730. The whole 30 of us. We didn’t know beer existed till college. Our mascot was Ned Flanders. Thanks, Ms. M.. Now time to get out of this wet suit and into a dry rub pork bbq sand. Bye for now. Isn't it great that we get these people who pick the sounds they like and deliver them to us, for our enjoyment, and enjoy them along with us, even when they're a little sick? Yay, Meghan, and feel even better soon! hahaha.... I'm on the mend! Thanks! This Jawbreaker is a blast from the past! I bought and saw this 7" when they were still based out of L.A. I'll have to look for it. Do you happen to know which label? ...so, it's NOT just available as an MP3. You can get nice FLAC files from the Bandcamp page. Who would download MP3s in this day and age when lossless files are available? People who've given up on life, that's who.